Can we all agree that one of the best things about camping is the food?! It's scrumptious. 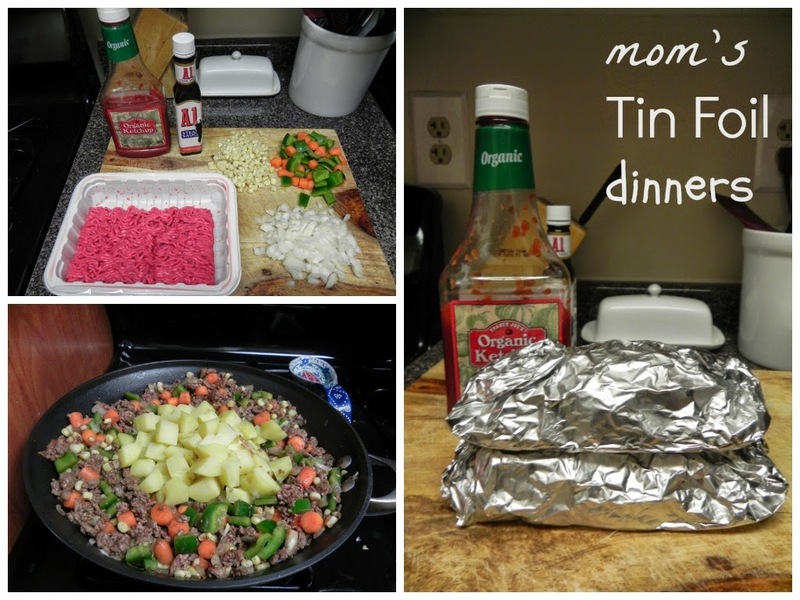 My favorite are these tin foil dinners that my mom always made growing up. I used ground beef, potatoes, green peppers, corn and carrots. You could easily switch any of these out for other veggies. I might try mushrooms, bell peppers... broccoli? You get the point. These are best if you make them a day or two in advance and refrigerate until you pack up. They should sit in a cooler overnight and will be ready after 30-45 minutes on the fire. All you need is a fork. Easy to eat and easy to clean up! Alright, here it goes. First saute the onions and garlic until light brown. Add the meat and cook until brown (sorry to you vegetarians out there!) Once the meat has browned, mix with the onions and add whatever seasoning you like. I went with just a shake of salt. I added the corn a couple minutes ahead of the condiments and other veggies because mine was frozen. Maybe that's why the corn looks strangely white in these pictures? Almost forgot the potatoes! Peel, dice and boil for about five minutes. You don't want the potatoes to be soft or to fall off the fork yet-- they'll get more heat once you're around the campfire! Return the pan to medium heat, add the potatoes and mix it up over medium heat for a couple more minutes. Makes 4-6 foil dinners, depending on how hefty you make them! Saute the onion and garlic over medium low heat for 2-3 minutes or until golden brown. Add the ground beef to the pan to brown. Once brown, combine meat with the onions and garlic. Season lightly with salt and pepper. Add corn and stir until combined. Season with ketchup and steak sauce. Heat for 2 minutes or until corn is soft. Add chopped carrots and green peppers. Meanwhile, boil the cubed potatoes for 5-7 minutes. Don't overdue it; the potatoes should still be relatively hard. Remember that they'll get more time over the fire! Combine cooked potatoes and the meat. Mix over medium heat for another 2-3 minutes. Dish onto sheets of aluminum foil. Wrap tightly and refrigerate up to four or five days. Enjoy... because they're delicious. Also because all you have to do next is throw them on the campfire for a half hour! I love coconut. I love family traditions. I love this cake. It was a favorite to make in my house growing up. 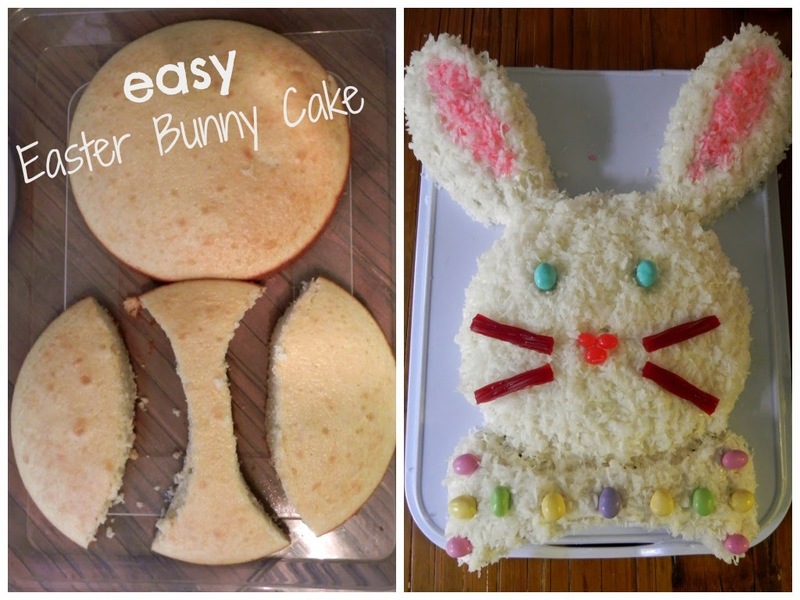 My sister and I felt like gourmet chefs when we got to mix, bake, cut, decorate and share our cake each Easter. And all it takes is a box of cake mix, frosting and some candy! 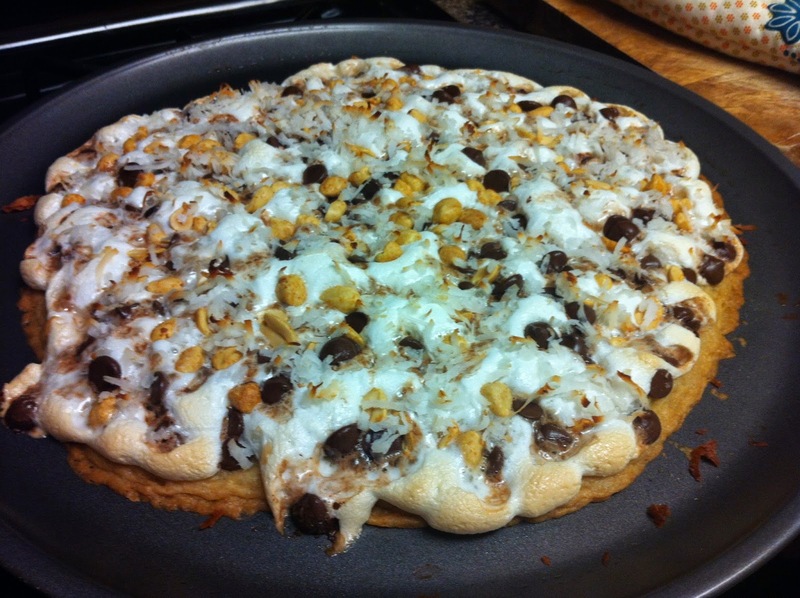 It's foolproof, kid friendly, and quite tasty. Bake your cake in two round pans (these are 9 inch). I cut mine a little too early, which resulted in an excess of crumbles. I'd suggest saran wrapping the tray and setting it in the fridge for an hour or two to keep it from falling apart. Cut one of the cakes into three pieces like below. It's hard to tell in this photo, because my initial cut was off, but this cake transforms into two bunny ears and one bow tie. I shaved off little layers from each of the cakes until I felt like the pieces were even and appropriately sized. 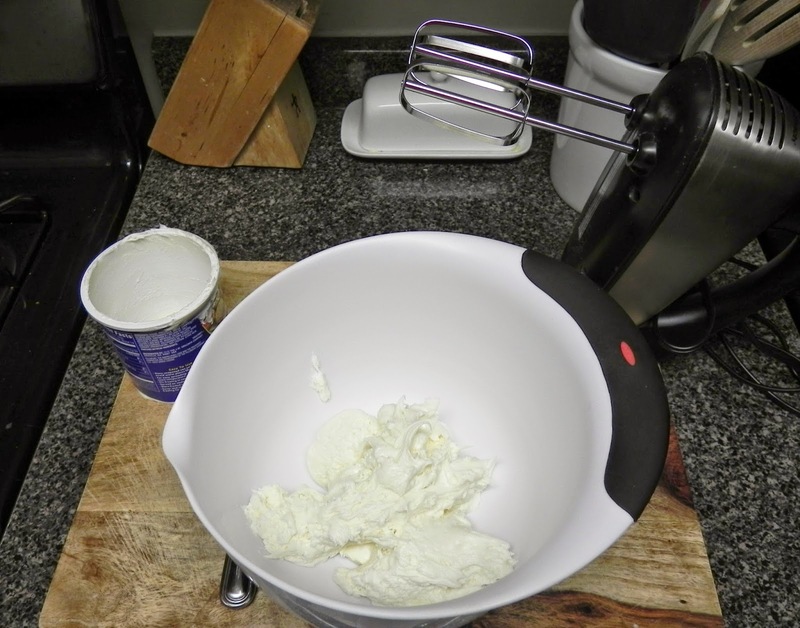 I only had one container of icing so I used a hand mixer to whip it for a couple of minutes. The wonderful result? It nearly doubled in size. Plenty of icing to cover the cake generously. This has got to be one of my favorite baking tricks. Even when I used a glass of warm water I couldn't get the icing to stick without picking up crumbs, especially on the inside cuts of the cake. 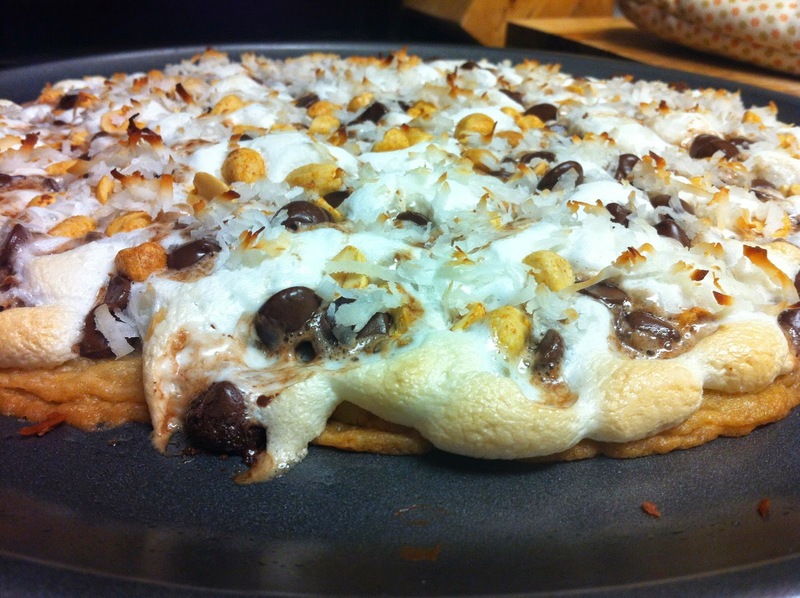 Thankfully coconut is a delicious and forgiving final layer! Use your hands to mix about 1/4 cup of coconut with two drops of red food coloring until combined. Spread the pink coconut to cover the inside of the bunny's ears. I used peanut m&m's for the eyes and bow tie decor, sour jelly beans for the nose and twizzlers for the whiskers. Any pastel colored, Easter themed candy will taste and look great. Get creative! I hope you enjoy your own (delicious) family traditions this Easter!